a friend in vienna told me of a nice collection of java examples, may be useful sometimes. Richard Baldwin’s Java Code collection. Been a while since this happened, but has to be bloggged. Ingrid and I went to the movies and watched g.o.r.a. at the alternative cinema “union kino” in Kaiserslautern. G.O.R.A. was hilarious. A turkish movie, telling the story of a carpet dealer abducted by aliens from the planet gora. Great acting, many many many dialogs (there is talking all the time actually), a story without surprises but fine jokes, and an audience good mixed with germans and turkish people. So we had laughter and chatting in the audience. The movie was shown in turkish original with german subtitles. The usual, hollywood-standard computer animations of spaceships are mixed in this movie with “wizard of Oz”-styled setups like a “forest of knoblauchwurst-growing trees”. Wizard of oz came to my mind more than once when watching gora. A person abducted to a fantasy place, meeting friends there, etc. Enough: If you have the chance of watching this, DO IT! Forget hollywood, the turks are coming. enter a telephone numer, output a set of words, including tricks with pronouncing numbers and GREAT visualisation of the result. The visualisation of the results inself is a must for every tool maker to see. Yesterday Ingrid went to get our new baby, a brand new iBook G4. We called it “eden” and I am moving many things on it. Apple is great, I waited to have one for years. I am really happy now. This is it, and I instantous fell in deep admiration to Apple. The real nice thing is, Eclipse runs slow but smooth and I can hack www.gnowsis.org with the thing. Simple thing, install eclipse, checkout gnowsis from cvs, everything works. cool, on Linux this was hell of a thing to do. ( the java install alone, argh). when humans and chatbots join, things like julie’s web interface may be the result. See the pictures of people in a chat room. lorebot, an IRC based bot who collects information from IRC services on who is online in different channels. Once this information is collected, it displays a “who’s online” information page, with links to further information provided by julie, a Redland bot who collects data from FOAF files. The lorebot page has pretty much all the documentation you’d need: if you’re interested in seeing how it works, you can stop by irc.freenode.net, #swig for a demonstration. For a version of what kind of data this spits out, see the: #swig online_users page. the deperate need for a “I need a rdf browser, quick!” made me to install isavic, brownsauce and ifered and ideagraph in 30 minuntes and try them out on a big SKOS file. libby was on #swig and pointed me to some apps. is running good, but is not end-user friendly. It should put out a message in system.out saying “now open your browser to localhost:8080/brownsauce” and then perfect. it is a rdf browser that uses a small web server (looks like jetty to me) and visualises rdf. great click-feel. fast. requires some apis to install, but no big deal. 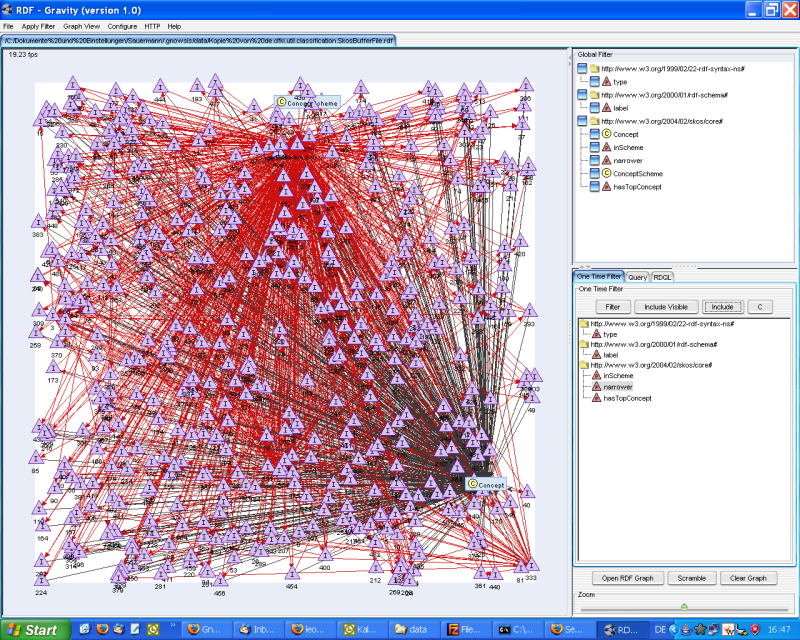 graphical rdf editor from intellidimension.com. quite ok, but no real rdf browsing. only basic editing, no end user thing. but the right direction, easy installable. quite cool tool. can propose its usage. download it. uses aqua skin, like we do in gnowsis installer. quite cool look and feel. better than any of the above. hm, so perhaps it is true what i said about the general rdf browser is not possible. its about the new Ultima Online, with Samurais. then it hit me like a hammer: the EA games people are “The Last Ninja C64 Edition” fans!!! Ultima Online continues the long lost “Last Ninja Series”! Oh my god, they use a history that is repeating! Ich verlief mich im Informatikgebäude an der TU Kaiserslautern, auf dem Weg zum Dekanat eklatant falsch abgebogen und auf die krummen Bahnen der Fachschaft geraten. Gute wahl dachte ich, kann ich gleich nach dem erdferkel vom letzten eintrag suchen. Gedacht, getan, mal bei der Fachschaft laut in den Raum gerufen “wer ist hier das Erdferkel?”, die antwort war dann “im anderen Raum, der mit dem neuen Mac”. Danke für den Hinweis, im anderen Raum sitzt dann jemand mit einem noch nicht abgekratztem, also neuem, powerbook. im Raum wird spürbar, dass hier mehr passiert als sichtbar ist. blogosphäre eben. Nebenbei hat mir die Literatur des Vorfalls geholfen, die anwesende Hackerin als Anika zu erkennen. Interessant dabei, dass der Frauenanteil der Informatik ja traditionell gering ist, in der Fachschaft aber erfreulicherweise relativ hoch. Miltiadis D. Lytras posted questions about how the Semantic Web did in 2004.
in good spirit of public discussion, i hereby blog my answer to his questions. 1. What was the Key achievement for Semantic Web in 2004? APIs. Forget the scientific glass-tower. Jena 2.0, Redland, Sesame, … that’s what counts and thats what makes things like Julie work. APIs enable developers to make products for people. Products that let people author RDF, publish RDF and use published RDF. 2. Which was the key technological achievement concerning SW for 2004? Widespread FOAF usage. Even TimBl mentioned FOAF in interviews. That’s ontology work alive. FOAF Camp, Enschede, Holland. August. 5. A project / project deliverable that you evaluated as of critical importance for SW, in 2004.
http://www.foaf-project.org thats where we come together. 6. Which is the Key obstacle that you anticipate as the ‘battlefield’ for the evolution of SW? Hot air coming from people that talk about “inference” while there is no widespread data available they can do their inference on. For me it sounds like “inferiour” than inference. Forget inference and OWL, stick to low tech RDF-S and procedural programming to get the SW lift off the ground. Ontologies written by people that do not code. They are crap. Without a reference implementation, OWL or RDF-S ontologies are useless. You hit the nerve only when you build a useful application that makes its data available in the ontology. Only an application shows how the ontology should be used correctly. See DubliCoren: half of the terms are vague and are used wildly. URL discussions. Much hot air on RDF-IG about what a URL denotes and why we should use URIs but no solution. As long as some people wait for the “perfect” system that uses unambigous URIs, nothing will be built at all. Gnowsis on the other hand goes the practical way: use changing URLs to identify stuff and begin coding SW today. btw: there is no inference engine that can work in a global, distributed, semantic web. i.e. would take an hour on my machine…. 7. A Business case that SW proved its capacity to solve real world problems. Vendor independent social networking solved by foaf (isntead of orkut, friendster, etc). News aggregation by RSS. that was real a kicker. 8. How did you saw the AIS SIGSEMIS Activities? What would you like from us the next year?